Have you signed up for the free Spirit Voyage Radio with Ramdesh podcast on Itunes? 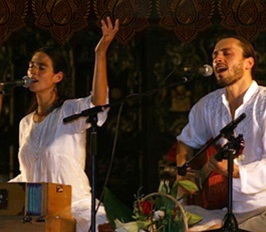 Tune into this podcast with Markus and Angelika of Mirabai Ceiba and learn all about their extraordinary new release Between the Shores of Our Souls. The music on this captivating album is set to lyrics by Rumi and Kahlil Gibran; Mirabai Ceiba and these beloved writers were simply meant for each other. From Durango, Colorado, the couple chats with Ramdesh about their new work. Angelika explains that they are very happy celebrating the birth of this album, which has been germinating for quite some time. The first pieces they started writing together were love songs, and this CD tells a bit of their love story. For years, the love songs were “tucked into our little sacred box” waiting for the right moment to bring them out and share. Fortunately for listeners, that moment has arrived! The album, Angelika says, is about the experience of sacred love; love in human relationships as well as love for the creator and love as a spiritual path. The next track is “Breeze at Dawn,” and again was a serendipitous find—this time in a little book at Kundalini yoga teacher Mahan Rishi’s house. Angelika says that Rumi’s poetry speaks “from such a deep place and such a clear soul.” After the couple’s second baby was born at dawn the music and lyrics came together; the piece is about the spiritual doorway that opens at dawn, and how sadhana time provides a quiet and silence to explore the soul. “Inside the Majesty” is next, a song written some time ago, but never recorded until now. A string trio including cello, viola and violin will carry you to a magical, mysterious space. Next, you’ll hear “El Instante Eterno,” a Spanish selection (Angelika’s first language). The lyrics (written by Angelika and a dear friend from Costa Rica) are about the ocean that exists between people, and the coming together that occurs when a commitment to love is made. “Ocean of My Dreams” is a wonderful poem by Rumi; Angelika was in Mexico and Markus was in his native country of Germany when they both began writing music to accompany the lyrics. Later they united to create this stunning track, joining the words with their heartfelt musical notes. Check out Mirabai Ceiba’s new videos with amazing nature shots on YouTube and come see the group at Sat Nam Fest Mexico (Angelika lived for ten years in the magical village of Tepoztlan where the festival will be held). Float across the ocean, revel in the clouds, and feel the light, love, and beauty that always emanates from this couple when they join their voices, instruments, and hearts. Mirabai Ceiba Returns to Spirit Voyage Radio with Ramdesh!